At the beginning of the month we did a survey of common seals on the Strand and counted 40 adults and over 25 pups. On the strand it is also possible to see migrating species like green shank and curlew which have been spotted passing through. The arctic terns have successfully bred on Eilean Ghaoideamal and raised a minimum of 31 juveniles. The day these youngsters were surveyed, two swifts were also spotted off the island. A young whooper swan spent a few days in the pools here on the reserve. 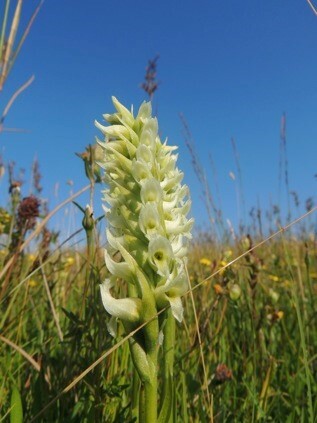 Irish ladies tresses orchids have been found again on Oronsay – so far 135 flowing spikes, making it an incredibly important site! The Colonsay and Oronsay juvenile chough have started to leave their family groups and to gathering in non-breeding flocks. The juveniles are particularly amusing to watch as they learn how to survive on their own. We have been watching the youngsters in their comical exploration tumbling around with clumps of sheep’s wool and tackling heather branches. 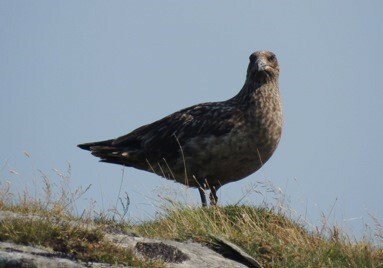 The bonxie or great skua pair have been on territory and have been proven to breed for the first time for Colonsay/Oronsay. These amazing birds are renowned for being pirates of the seas. They will harass birds as large as gannets forcing them to drop their catch for the skuas to take. With the amazingly hot weather some of us have been rockpooling and snorkelling. We have seen some beautiful marine specimens including a cuttlefish, seahare, sea gooseberries, a comb jelly, an elver (eel), dahlia, beadlet and snake-locks anemones, a live spotted cowry, and much more. Click on the name to see a picture of the live and beautiful cowry. Many of us know cowries give the finder good luck. They have been used as a form of currency in far flung places like China and India for over three thousand years. This large group of marine snails, come in many different sizes and colours depending on where the particular species is found in the world. However, in all forms it has had an important impact on human culture with its use as currency and in trade and in cultural ceremonies all over the world. The word porcelain is derived from the old Italian word for cowry due to the shell’s natural shine and texture. The ‘sea bird girls’ or STAR researchers Tessa and Ruth have finished their work on Colonsay after a successful season. We are sad to see them go, but look forward to seeing them again next year.